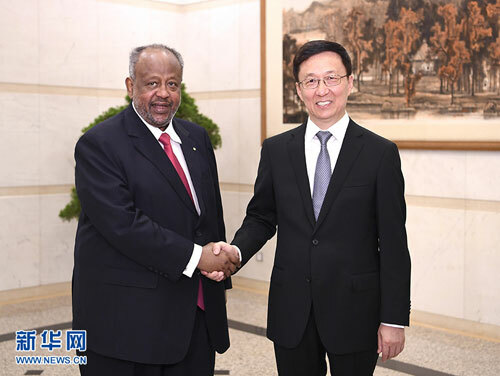 BEIJING, Sept. 2 ,Chinese Vice Premier Han Zheng on Sunday met with Djiboutian President Ismail Omar Guelleh ahead of the 2018 Beijing Summit of the Forum on China-Africa Cooperation. Han welcomed Djibouti's active participation in the Belt and Road construction and called on the two countries to build on the momentum of the 40th anniversary of diplomatic ties next year to expand exchanges and cooperation, and elevate China-Djibouti strategic partnership to a new level. Expressing gratitude for China's invitation on jointly building the Belt and Road, Guelleh said Djibouti is ready to work with China to boost cooperation and yield new outcomes.